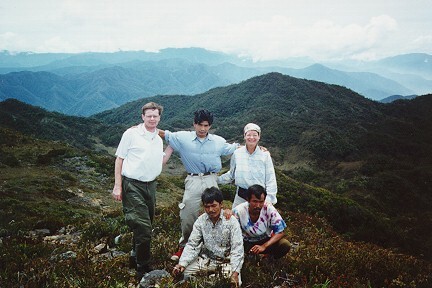 In september 1996 we did make a trip to Mount Leuser National Park in northern Sumatra. As part of the trip we climbed Mount Kemiri (Gunung Kemiri in local language), 3314 meters high. Starting point for the trip was the the valley of the river Alas. The nice thing about climbing such a mountain in Sumatra is that after one and a half day you get above the rain forest, which gives a different type of vegetation. The best place to start expeditions into the Mount Leuser National Park is from the village of Ketambe, 25 km north of Kutacane. The best guides you can get at the Wisma Cinta Alam guest house. The whole family consists of guides. The old man was a land surveyor in the past and has passed the profession on to his two sons, Johan and Ismael. Both are nice guys, who know the area very well and they also speak good English. If you have plans in this direction, my recommendation is not to accept all kinds of offers (from middle man) in places like Medan or Berastagi, but to hire the guides yourself in Ketambe. We had a most marvelous trip. Find here some pictures of the local scenery. For ideas on other possible trips, look into the general information of the Wisma Cinta Alam and about the other tours they can organise.